Ouch! If that's the sound that you have made while walking across the floor at night, you are a parent who's kid loves LEGO. You know what I'm talking about because you have had to surgically remove one of these building blocks from your feet before. 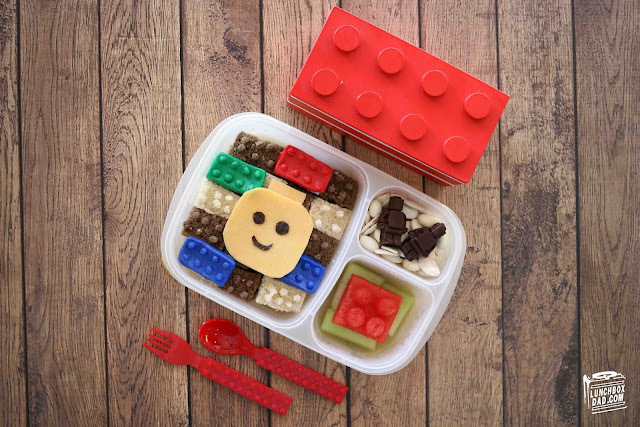 Because I love my kids and, despite the pain, because I love LEGO, I made them this LEGO minifigure lunch for my family. This is actually easier to make than it looks because I used silicone molds, which you can find on Amazon. I used them to make the colored parts of the LEGO brick sandwich and the chocolate minifigs in the LEGO trail mix. The lunchbox that the lunch is in is an Easy Lunch Boxes container. 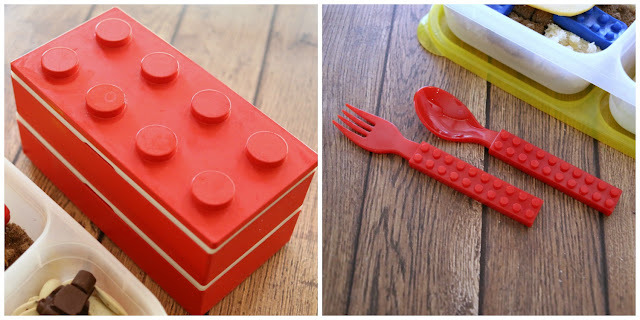 The other building brick lunchbox and utensils were bought online. I think you can find those on Amazon as well. I packed my youngest's lunch in that box. Scroll down to see the whole recipe. Ingredients: Whole wheat bread, honey, sourdough bread, sandwich filling, cheddar cheese, nori (roasted seaweed), different colored fondant, pumpkin seeds, yogurt covered raisins, melting chocolate, honeydew melon, watermelon. 1. Place one slice of whole wheat bread in the bottom of main compartment. Top with your kid's favorite sandwich filling (meat, cheese, nut-free spread, jam, etc.). Cut two different types of bread into multiple sized rectangles. 2. To make the LEGO dots that go on top, poke a piece of straw into scraps of bread. Use a toothpick to poke out the dot of bread from the straw. Then glue the bread dot onto the bread rectangle using a dab of honey. Repeat with all of the bricks and place on top of sandwich. 3. Cut a slice of cheese into the shape of a minifigure head as shown. Cut eyes and mouth out of a sheet of nori. Nori will stick to the top of the cheese. Place the cheese on top of the bricks. 4. Press a tiny bit of fondant into a LEGO brick silicone mold. Remove and place on top of bread. I use a small piece of parchment paper under the fondant to keep it from melting onto the bread. Repeat until you have four different colored bricks. 5. 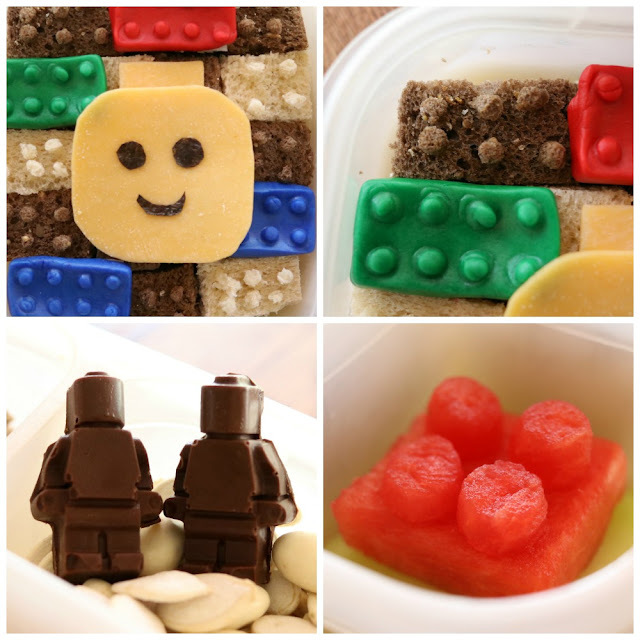 Melt chocolate and spoon into a LEGO minifigure mold. Let cool then remove from mold. Mix pumpkin seeds and yogurt covered raisins together in side compartment. Top with chocolate minifigs to make trail mix. 6. Cut honeydew and watermelon into squares. Place in other side compartment. Cut out four watermelon circles and place on top of watermelon square. You can attach them with toothpicks. 7. 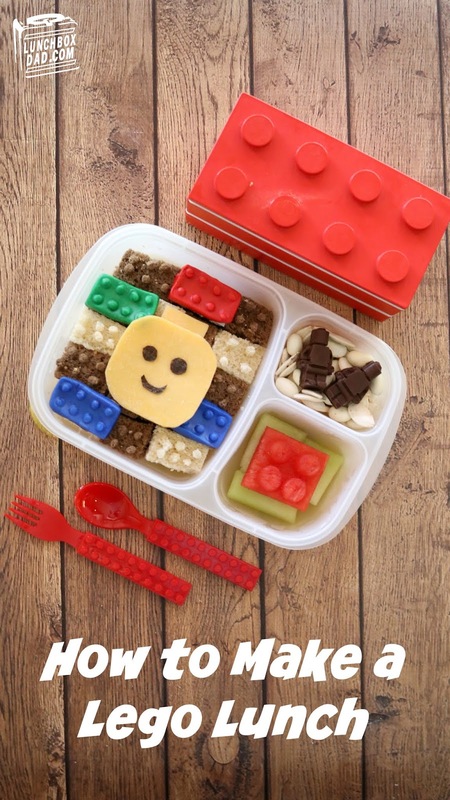 If desired, throw in some other LEGO accessories to dress the lunch up even more! This post contains affiliate links which means that I get a little cut if you purchase those items on Amazon.